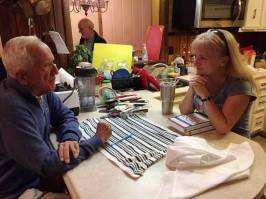 My life was forever changed by the research, tenacity, and courage of T. Colin Campbell, PhD. Certainly, I respect his list of professional accomplishments; however, more than that, I stand in awe of his courage, integrity, and determination to follow the truth, wherever it leads and whatever the costs–personal or professional. All quotes in this post are from Dr. Campbell. “How did we forget the lessons from the past? How did we go from knowing that the best athletes in the ancient Greek Olympics must consume a plant-based diet to fearing that vegetarians don’t get enough protein? 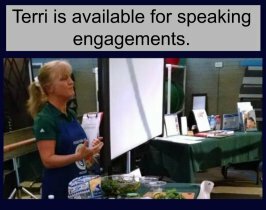 How did we get to a place where the healers of our society, our doctors, know little, if anything, about nutrition; where our medical institutions denigrate the subject; where using prescription drugs and going to hospitals is the third leading cause of death? 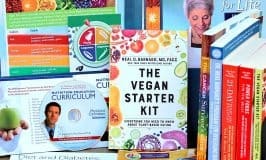 How did we get to a place where advocating a plant-based diet can jeopardize a professional career, where scientists spend more time mastering nature than respecting it? How did we get to a place where the companies that profit from our sickness are the ones telling us how to be healthy; where the companies that profit from our food choices are the ones telling us what to eat; where the public’s hard-earned money is being spent by the government to boost the drug industry’s profits; and where there is more distrust than trust of our government’s policies on foods, drugs and health? 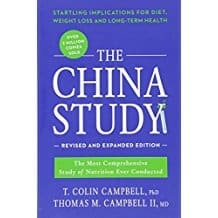 Dr. Campbell’s best known work, The China Project, showed that high consumption of animal-based foods is associated with more chronic disease, while a primarily plant-based diet promotes health. During his long career, Dr. Campbell was maligned and harassed by many of his colleagues about his outspokenness that went against the status quo. “I did not begin with preconceived ideas, philosophical or otherwise, to prove the worthiness of plant-based diets. I started at the opposite end of the spectrum: as a meat-loving dairy farmer in my personal life and an ‘establishment’ scientist in my professional life. I even used to lament the views of vegetarians as I taught nutritional biochemistry to pre-med students. …My journey in science over the past forty-five years has convinced me that it is now more urgent than ever to show how people can avoid these (health) tragedies. The China Study project that began in the 1980’s, was a 20-year long epidemiological study described by The New York Times as “the Grand Prix of epidemiology” and conducted in joint effort by the University of Oxford, Cornell University, and the Chinese Academy of Preventive Medicine. The China Project was performed on a human population in China to discover patterns of disease and factors that influence them. China was the chosen location due to the genetic similarity of the people, though there were major differences in rates of cancer in different areas. The differences were 10-100 fold. In comparison, in the US at that time, the differences were only 1.5-2 fold for different areas. Therefore, it was believed that environmental factors could be playing a significant role in chronic disease incidents. 6,500 Chinese citizens, ages 35-64, participated in the study, from 65 different countries. 367 variables were measured, including blood and urine samples, food and soil samples, viruses and toxins like pesticides and heavy metals. The consistency of the results, after detailed analysis of the data, led researchers to conclude that overall, the closer people came to an all plant-based diet, the lower their risk for chronic disease. Even small differences in amounts of animal protein in people’s diets raised cholesterol and disease incidence. “The American people need to know the truth. They need to know what we have uncovered in our research. People need to know why we are unnecessarily sick, why too many of us die early despite the billions spent on research. 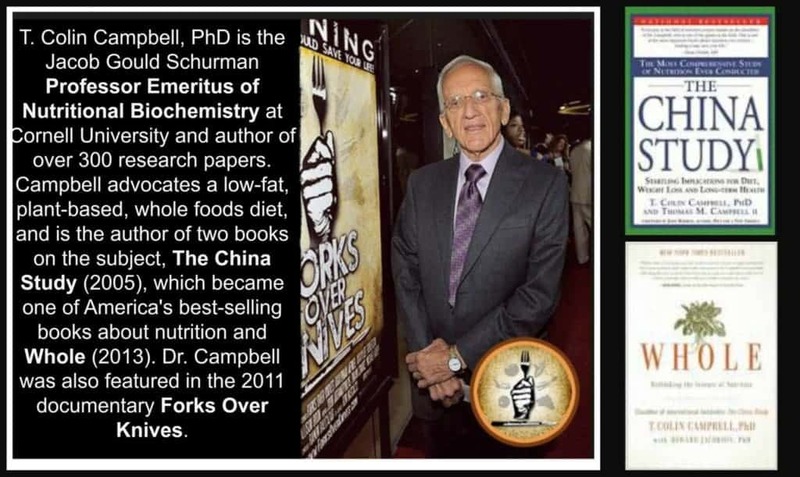 Dr. Campbell’s theory that plant-based foods, as a class, promote health, whereas animal-based foods, carry health risks, came not only from the China Project, but a collective body of scientific evidence that has received much attention and numerous awards. “When all was said and done, my colleagues and I were honored to have received a total of seventy-four grant-years of funding. In other words, because we had more than one research program being conducted at once, my colleagues and I did seventy-four years’ worth of funded research in less than thirty-five years. From this research I have authored or co-authored over 350 scientific articles. Numerous awards were extended to me and to my students and colleagues for this long series of studies and publications. It as taken decades, but finally the missing links–the healthcare system itself and academia–are beginning to respond. 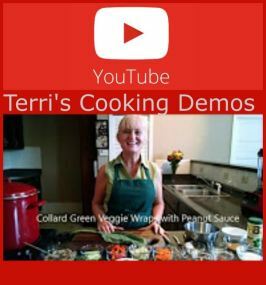 The 3-minute video below shows the interest after a screening of the 2015 film Plant Pure Nation at University of Cincinnati College of Medicine. If this is any indication, we are on the brink of change. “I believe that the world is finally ready to accept it. More than that, I believe the world is finally ready to change. We have reached a point in our history where our bad habits can no longer be tolerated. We, as a society, are on the edge of a great precipice: we can fall into sickness, poverty and degradation, or we can embrace health, longevity and bounty. And all it takes is the courage to change. 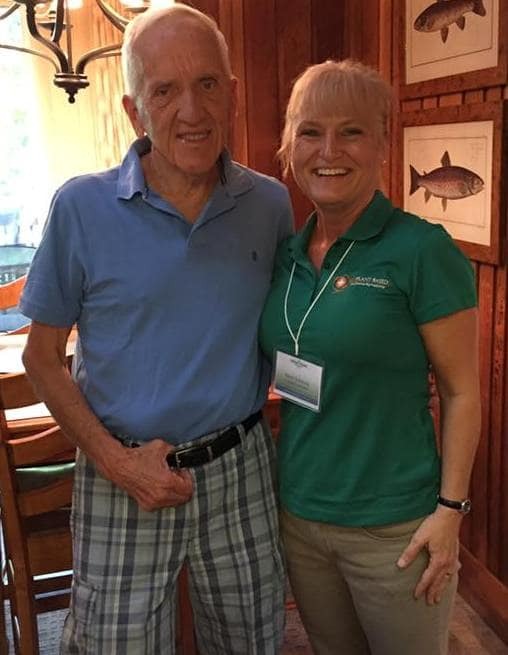 These are pictures of me and Dr. T. Colin Campbell at the Plant-Based Cooking Summit in Oct. 2016. What an honor be asked to work with the Campbell family. It was on my bucket list. I hope to have another opportunity in the future! What an honor to meet and talk with this plant-based giant. The China Study book is available on amazon. Click to see book details. Affiliate link. It’s hard for me, age 73 and with bifocals, to read the words on the deep green background, so I gave up. I don’t know whether others have this problem. Dr. Campbell’s book “Whole” is a must read. 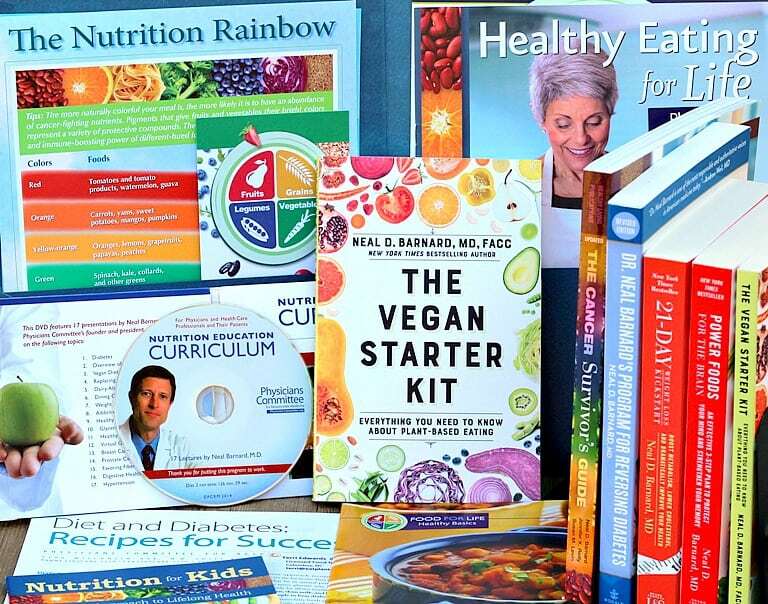 Understanding the failure of the reductionist approach to nutritional and biological science is a key to understanding the failure of modern medicine to solve or even impact our major health problems.